Still from Alien3 (1992) © Brandywine Productions / 20th Century Fox. Image Source: Alien Explorations. In 1991, David Fincher directed the Alien sequel, Alien3, which was a decade and a half ahead of its time. The film was nearly ruined by studio interference and production problems. It had previously gone through versions to which science fiction author William Gibson, Eric Red (writer of the cult horror films The Hitcher and Near Dark), future Riddick director David Twohy, and New Zealand director Vincent Ward all separately contributed. What audiences and critics found more difficult was the gloomy, apocalyptic plot. Alien3 marked the new era of the compromised protagonist. It was a fraught with despair, a difficult narrative for audiences accustomed to triumphant cinematic conclusions. The heroine, Ellen Ripley, is even more heroic because she is not going to win. 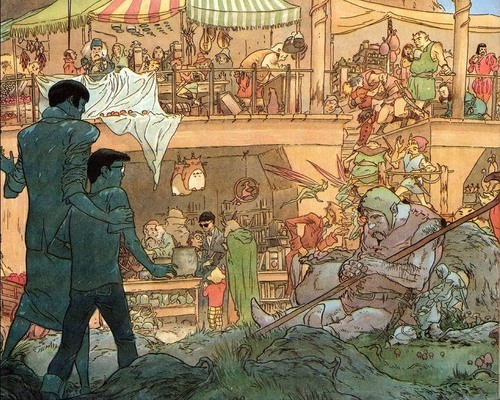 Gaiman's character Tim Hunter in the Faerie Market © DC Comics. Image Source: Best Comics Quest! "Science is a way of talking about the universe in words that bind it to a common reality. Magic is a method of talking to the universe in words that it cannot ignore. The two are rarely compatible." The Books of Magic are one of the sources from which J. K. Rowling likely lifted her original Harry Potter ideas. Gaiman's series was listed in 500 Essential Graphic Novels. 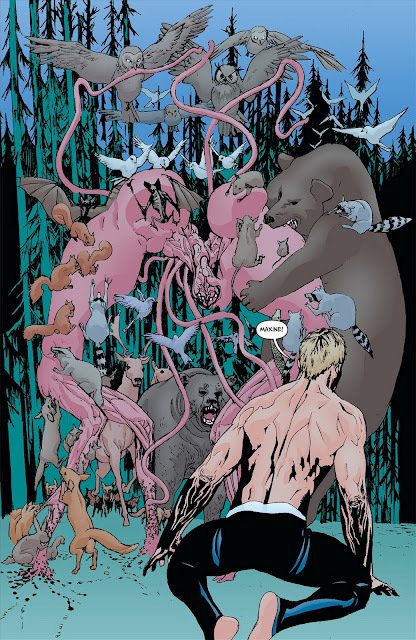 Animal Man #5 (March 2012). DC Comics' deeper descent into anti-heroic darkness is strangely opening moral doors. DCnU has reinforced some problems that became endemic during Dan Didio's era. However, the new Animal Man and Swamp Thing series are exceptions, due to the reintegration of Vertigo themes and characters into mainstream DC cape comics. These two books started by humming along in Hellblazer/Swamp Thing/Sandman/Animal Man mode circa the late '80s and '90s. I initially greeted the familiar motifs with skepticism, but in January, the nu Swamp Thing and nu Animal Man exploded up to must-read status (see almost-unanimous praise for Animal Man #5, which came out in early January, here, here, here, here, here and here). Adaptation of Morgan's poem The First Men on Mercury by Metaphrog. Neil Gaiman recently tweeted on a cool comics adaptation of The First Men on Mercury, by Scots poet Edwin Morgan that was circulated in the UK for 2009's National Poetry Day. Morgan sadly died on 17 August. Yesterday, BBC Four interviewed Neil Gaiman, David Eagleman and Sarah Millican on the last episode of its current series for the radio show Museums of Curiosity. You can listen to the show between June 14 and June 20 here. After that, it goes offline. 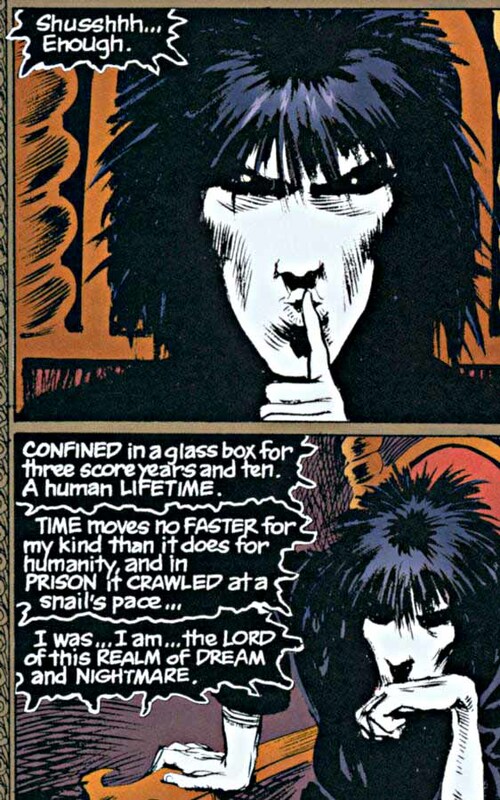 Neil Gaiman is the award-winning British writer whose work on DC's Vertigo comic The Sandman ran from 1989 to 1996, in which he portrayed the Sandman, the master of the realm of human dreams, as a postmodern epic hero.